How much does increasing energy consumption improve quality of life? 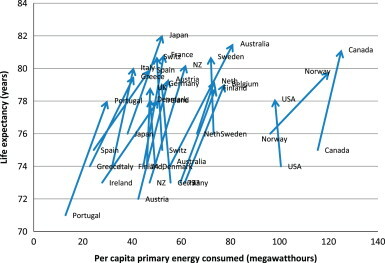 First, quality of life, as measured via the human development index, versus the annual per capita electricity usage for a wide variety of countries. In both of these, the first-order message is that there is a strong correlation between energy usage and quality of life, and the fact that you see a strong correlation even in the case of life expectancy highlights that the relationship is deeper than superficial things such as the comforts provided by personal electronics, bigger houses, etc. Of course, one should be careful reading too much into these plots. Yes, increased energy usage is correlated strongly with improved quality of life. But, that doesn’t mean that conservation of energy leads to a decreased quality of life. For me, studies such as this drive home the need for diversification of the energy landscape through renewables. Of course, we should eliminate inefficiencies in our energy usage. 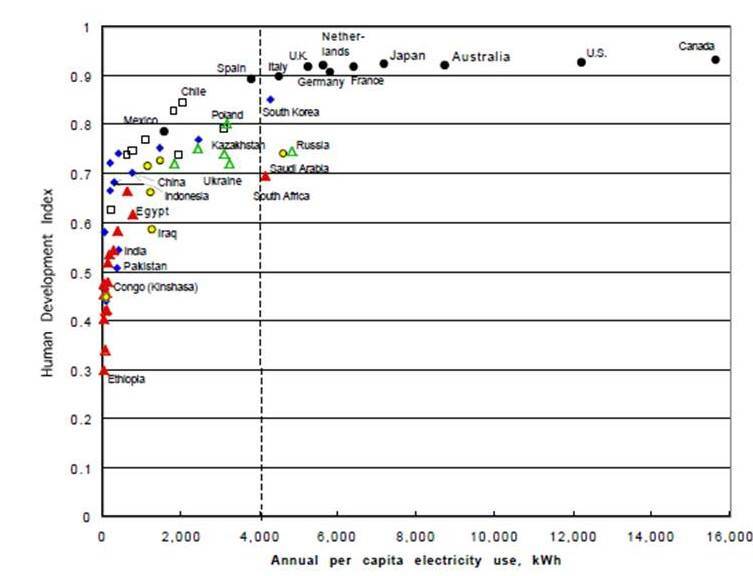 But, it is unrealistic to expect such efficiency improvements to stem the growth of energy consumption significantly. One of the wins of renewables is that that they can allow society to continue to have large growth in energy consumption for the foreseeable future — and this continued growth in consumption is necessary for significant quality-of-life improvements (including life-expectancy improvements) in large parts of the globe. This entry was posted in Perspectives and tagged Energy. Bookmark the permalink. Well… I, on the other hand, is a believer that R&D on energy efficiency can contribute a lot. Here is a very informative and impressive book – Real Prospects for Energy Efficiency in the United States – talking about how much energy we can save by improving the efficiency and the best ways to stimulate the R&D. I was surprised by how inefficient we are now by just going through the executive summary. Yes, I agree… Energy-efficiency R&D can definitely contribute a lot! But, I think the impact of Jevon’s paradox is pretty daunting — increased efficiency always always leads to increased consumption (not decreased consumption). 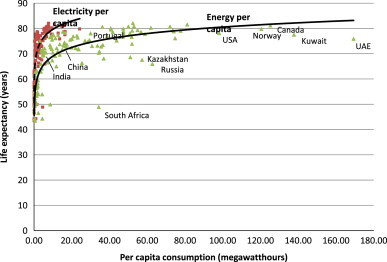 And, I guess the data in the post tries to argue that this increased consumption typically is correlated with increasing quality of life… My take-away is that this is one (of the many) reasons why sustainable energy usage is an important (and very different) target than simply energy-efficiency. Pingback: Rigor + Relevance | Data centers & Energy: Did we get it backwards? Pingback: Rigor + Relevance | Would renewables still be a good idea if fossil fuels didn’t have negative environmental consequences?